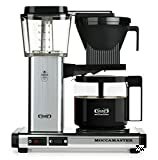 The Technivorm Moccamaster is widely regarded by coffee enthusiasts as the best automatic drip brewer available on the market today because it creates a manually-brewed cup of coffee, which is notorious for extracting the most flavor from the bean, without the manual labor. What’s So Great About the Moccamaster KBG 741? It retails at around $300, so it clearly isn’t winning any awards for affordability in a market filled with automated machines that start around $20, begging the question: is it worth it? 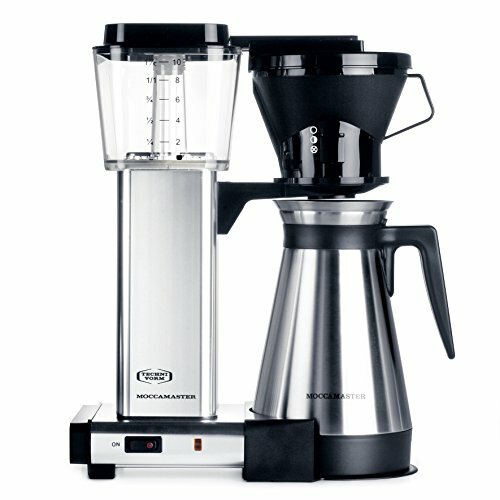 Today I’ll review the Technivorm Moccamaster KGB 741, one of the most popular Moccamaster models. Each Moccamaster brewer is designed using the same core technology so although I’m looking at the KGB 741 specifically, the brewing technology is the same across the product lines. 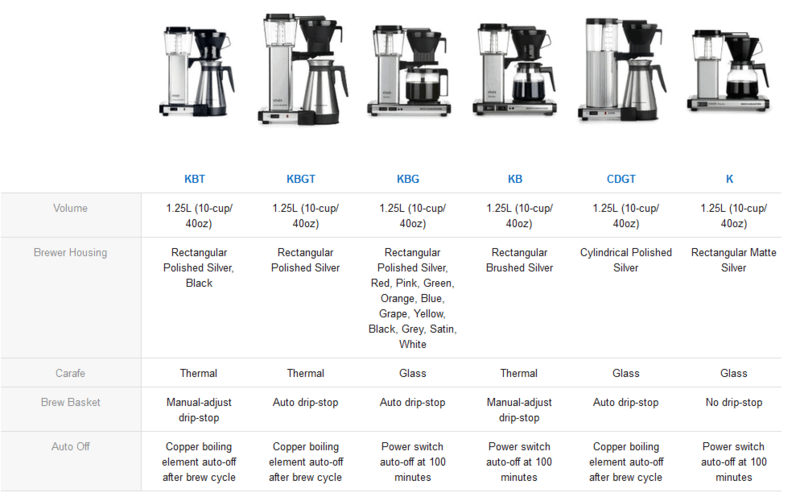 At the end of my review, I’ll include a comparison chart to help you decide which Technivorm Moccamaster would work best for you. I’ll base this review on what the industry experts say about the brewer, and check in with the verified purchasers in my coffee brigade to hear what they think about it. The coffee brigade is an online community of coffee fanatics who share the best and worst of their caffeinated experiences to help others brew their best cup. 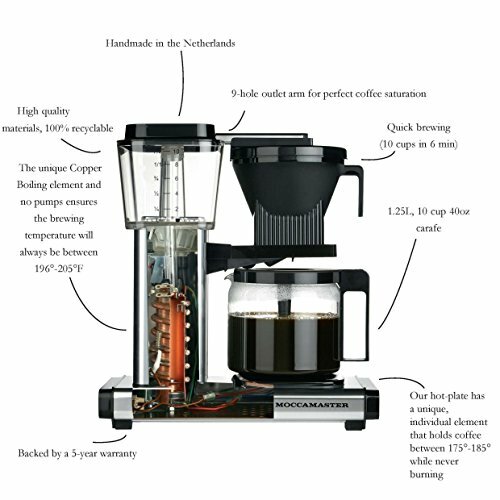 Technivorm is an environmentally-conscious enterprise based in the Netherlands that only produces handmade automated coffee machines and grinders. Its founder Gerard C. Smit invented the Moccamaster, the first automatic brewer specifically engineered to replicate the manual brewing process, over fifty years ago. Since then, the Moccamaster has evolved from a novel first edition to an expertly crafted machine that regulates extraction time and temperature to produce a palatable cup to rival any manual brew. Their business plan gives Technivorm a competitive edge in a crowded marketplace: they aren’t interested in diversifying their product lines with cheese graters or panini presses like major manufacturer Hamilton Beach, nor do they want to invent combination brewers that offer both single-serving and carafe brewing options like Keurig. All of Technivorm’s research, development, and most importantly, money, is committed to creating the best handmade premium automated coffee brewers and grinders that are energy efficient and 100% recyclable. These brewers have earned certification from the Specialty Coffee of America, the European Coffee Brewing Centre and the Specialty Coffee Association of Europe. Let’s be honest, $309 is a lot of money for an automatic brewer. Why should you spend that much money when there are so many other cheaper automatic brewers available? The bottom line is, you get what you pay for and in this case, it’s a premium automated brewing environment. If you want a machine to simply brew coffee, a $40 run-of-the-mill brewer will get you what you need, but if you want a refined brewing experience you don’t have to micromanage with stopwatches and thermometers, this is the ideal machine. Automated coffee brewers are popular because they are easy to operate and clean. You put the grinds in the basket, water in the reservoir, hit a button and voila! —coffee is ready. The only reason people choose manual methods over the automated option (besides access to electricity of course) is that manual brewing methods like French Press extract more flavor from the beans creating a richer cup of coffee. When Technivorm’s founder invented the Moccamaster, he knew for it to truly rival manual methods it had to do three things well: regulate temperature, extract the maximum amount of flavor from the beans by creating the perfect bloom, and make the machine extremely user-friendly. He succeeded doing just that with the Moccamaster KBG 741. It has three features that make it worth the money: two separate heating elements, a 9-hole outlet arm, and a user-friendly interface that allows easy operation. The Technivorm Moccamaster KG 741 has two different heating elements: a copper heating element for brewing and an independent warming element for keeping it hot after it brews. The highly conductive copper element is what will excite coffee enthusiasts: it rapidly brings the water within the 195-205-degree range, the ideal temperature zone for brewing. This is great news for people who want the taste of a manual brew without the work! Lazy people rejoice—we can have good coffee without working for it! But seriously, if you have ever watched someone manually brew you will notice how carefully they monitor the temperature of the water while brewing. The goal is for the water to reach that optimal 195-200-degree range, the ideal temperature to steep grinds. If the water is too cool it will create a weak cup, too hot a temperature can burn the beans and produce a bitter brew. To get within that ideal temperature range, the Moccamaster has a 1000-watt dual coil heater and an insulated hot water siphon, so the water remains at its optimal temperature throughout the brewing process. After brewing, the glass carafe sits on an energy-efficient warming plate that keeps the coffee between 176-185-degrees based on the user selecting the “high” or “low” heat setting. This degree of heat, and the fact the Moccamaster consistently brews at this intensity time and again is why it is such a popular machine, and a big reason it warrants a higher price tag. You typically don’t witness how the water is dispersed into the grinds when using an automatic brewer; it’s almost always hidden within the machine, the sound from the brewing your only clue as to what is going on in there. This arm ensures the complete saturation of all the grinds, creating that perfect bloom you need for a flavorful cup of coffee. Once you fill the reservoir with water and the basket with your fresh grinds, all you do is turn it on. No more annoying electronic prompts you don’t need or multiple screens to pass through just to start brewing; this machine keeps it simple. The Moccamaster only has two buttons: one to turn it on and off, and a heat setting for the warming plate. You really can’t mess this up, even when your eyes are half-mast in the wee hours of the morning. 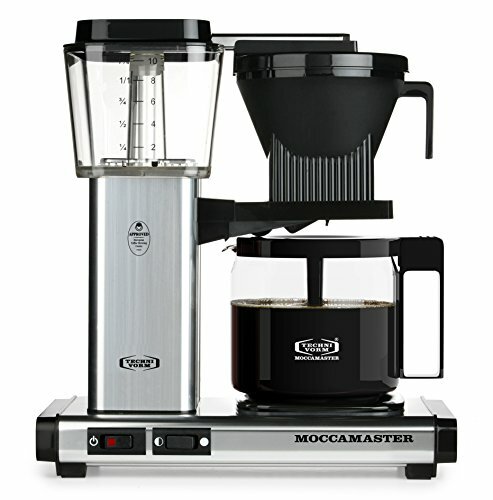 The beauty of the Moccamaster KBG 741, or any Moccamaster, is its simple yet powerful design. It creates the ideal brewing environment for your coffee to bloom, transforming water and beans into caffeinated cups of joy. The Moccamaster was designed for the more refined coffee brewer in mind; someone that buys micro roasters and single-origin beans to create their ideal cup of joe. If you plan on brewing store-bought pre-ground coffee, this is not the coffee machine for you. Is it more expensive than the average brewer? Yes, but for those that love all things coffee, it’s worth the cost. Previous Post: « A Review of the Low-Cost Cuisinart DBM-8 Supreme Automatic Grinder: Is It Too Good to Be True?